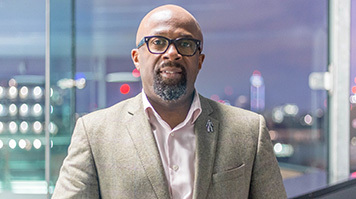 There are some people whose energy and warmth lights up a room – and Tunji Akintokun (MSc Information Systems Engineering, 1993) is one of them. On the day of our interview, he arrives, buzzing with enthusiasm. ‘I’ve just had coffee with someone I met through a workshop for women returners run by TechUK and everywoman,’ he says. It’s a brief but telling insight into his modus operandi. There are no frills, and no formality. In Tunji’s world, it’s all about making connections: finding people who share his desire to bring down the barriers to equality of opportunity, and galvanising them into action. His is a network that’s growing all the time. Tunji’s involvement with everywoman – he’s a judge at their annual technology awards – is only the start of a long list of extra-curricular commitments that includes sitting on the Business Leader Council and mentoring for Teach First, working as an ambassador for national education and careers provider STEM Learning and judging the Black British Business Awards. He is also a patron of the autism charity CASPA and a Vibrant Economy Commissioner at accounting and consultancy firm Grant Thornton. Then of course there is his first highly successful social enterprise Your Future, Your Ambition, which between 2012 and 2016 engaged over 3000 young people in inspiring events and activities designed to help them pursue their STEM-related career ambitions, and provided mentoring for 600. All this on top of a demanding day job as Cisco’s Director of Mid-Market Customers and Partner Organisations in Africa. So what is it that drives him? ‘My belief in the power of education to transform lives is based directly on my own experiences,’ he says. Sadly, Tunji’s father, who had sickle cell anaemia, died when he was just two. He stayed with his foster parents until he was eight, when his mother remarried, but tragedy struck again when she died just three years later. Tunji’s relationship with his stepfather was a difficult one, and at 13 he found himself homeless when his stepfather returned back from Nigeria and sold the family home. He sought refuge in a hostel in Forest Gate, where he stayed until he finished his O-levels. It’s an example that goes a long way to explaining why someone as dynamic as Tunji has spent 18 years of his career with the same employer. ‘Cisco is very open, and very willing to examine itself,’ he says. ‘Also, every time I’ve considered the possibility of a new challenge outside of the organisation, Cisco has responded. I’ve had some amazing opportunities and experiences here. My unofficial motto is “Disrupt yourself before someone disrupts you”. It’s important to keep moving, otherwise you won’t keep growing as a leader. What’s been your proudest moment so far? There have been so many! I was really honoured to win a National Diversity Award for my work in diversity, mentoring and STEM. And I’m really proud of what we achieved with Your Future, Your Ambition. But it’s hard to beat being chosen as a torchbearer at the 2016 Rio Olympics. That’s a truly once in a lifetime experience. What’s the most useful thing you’ve learned recently? In 2013 I was lucky enough to spend time at Stanford University, studying design thinking. The idea is that you can learn to be innovative by taking risks and rethinking and remodelling until you come up with something that works, rather than sitting around waiting for a brilliant idea. Basically it comes down to the old cliché about inspiration vs perspiration, and it’s something I draw on every day. I work across six Cisco locations in Africa – so usually it’s just wherever I can find a desk! But my office at home in London is full of African contemporary art and sports memorabilia that I find very inspiring. Also, most of the time I work standing up. I find I feel less restricted and more energised that way. How do you know when it’s time to move on? I have a three-year rule. The first year you’re in a role, you’re working out how to do it. The second year, you start to become competent. And in the third year you can start to get a bit complacent if you’re not careful. Once I start to feel like I’m mastering a role, then I know it’s time for a change. If you’re inspired by Tunji’s commitment to increasing the number of young people studying STEM subjects and their access to opportunity, let us know. The University works with local schools, including our own South Bank University Academy of Engineering and South Bank Engineering University Technical College, to help inspire young people to study STEM and build local networks of support. Email us at alumni@lsbu.ac.uk to find out more.